Himsra (Capparis spinosa) is a perennial plant that grows mainly in the Middle East, East Africa and parts of Central and Southern Asia. Himsra can also be found growing in parts of Europe, usually in similar locations to those that are conductive to olive grove growth. Himsra is also called the caper bush, Cabra or Flinders rose, and is part of the Capparideceae or caper family of plants. Himsra is used in traditional Chinese, Unani and Ayurvedic medicine. The plant is characterised by round fleshy leaves, with distinctive white or pinkish white flowers (see illustrations). A number of parts of the plant are edible including the flower buds and the fruit berries and these are traditionally used for culinary purposes in parts of the Middle East, India and Mediterranean countries including France and Italy. However, most of the plant can be used medicinally for its biological effects. A large body of scientific evidence supports the use of himsra in the treatment of a wide variety of ailments. 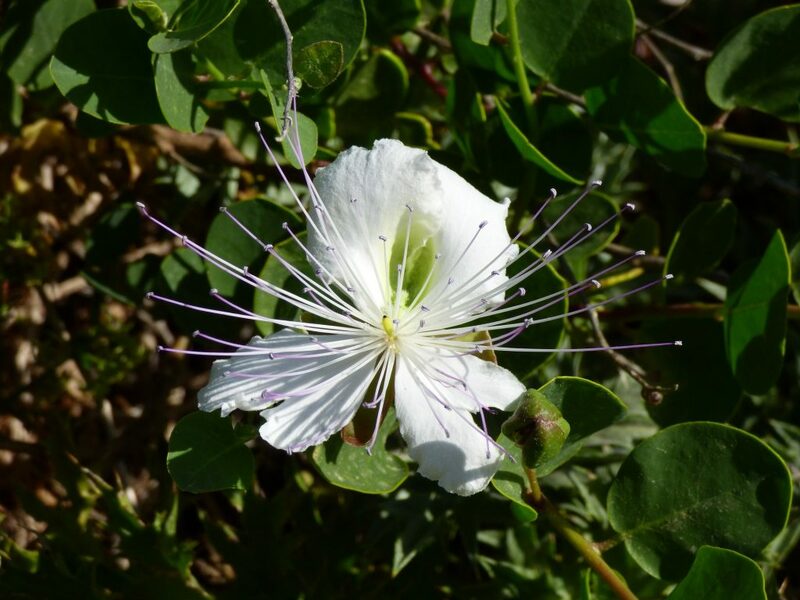 Himsra (Capparis spinosa) is an important culinary and medicinal plant. The flower buds and fruit berries are often used in cooking, but most of the plant can be used as a herb, medicinally. Extracts of himsra have been shown to possess antioxidant, anti-inflammatory, antiviral, diuretic, tonic and diuretic effects. These effects may be due to the presence of flavonoids and glucosinolates in the plant. The medicinal effects of himsra include antioxidant, antiviral, immunomodulatory and anti-inflammatory effects. It is likely that these effects contribute significantly to the hepatoprotective effects of the herb. Inflammation and the generation of oxidative stress is a significant contributor to the liver damage associated with xenobiotics (such as poisons, toxins, pharmaceuticals and pollutants). As flavonoids have antioxidant, antiviral and anti-inflammatory effects, it is tempting to speculate that the flavonoids present in himsra, which include quercetin-3-O-rutinoside (rutin), may be responsible for the hepatoprotective effects. However, himsra also contains a group of chemicals called glucosinolates. Glucosinolates can be converted to isothiocyanates in humans and animals and these glucosinolate metabolites are hepatoprotective due to the way they balance the different phases of metabolism in the liver. Both flavonoids and isothiocyanates may contribute to the liver protective effects of himsra. Himsra is also known as the caper bush or flinders rose. A number of important phytochemicals including stachydrine (a pyrrolidine betaine), alkaloids, phenolic acids and tannins, polyisoprenoid alcohols, flavonoids (including rutin), coumaric acid, nicotinamide, β-sitosterol and glucosinolates have been isolated from himsra. Extracts of himsra also contains gums and mucilages. A number of studies have investigated the hepatoprotective effects of himsra. Root extracts of himsra have been shown to be protective against experimentally induced hepatotoxicity in rats. A polyherbal formula (an extract containing many herbs) containing himsra has been shown to be effective at inhibiting experimental induced hepatotoxicity in rats. Other herbs present in this formula included kasani, kakamachi, arjuna, kashmarda, birranjshipa, jharuka. A number of cell culture studies have shown the beneficial effect of himsra containing herbal extracts on liver cell antioxidant defences. In one such study, a polyherbal formula containing himsra, kasani, kakamachi, arjuna, kashmarda, birranjshipa and jharuka was effective at preventing the depletion of antioxidant enzymes from liver cells. The glutathione content in the cells increased by 74 %, and the antioxidant enzymes catalase, glutathione peroxidase and superoxide dismutase were increased by 46 %, 22 % and 81 % respectively, suggesting significant antioxidant effects. 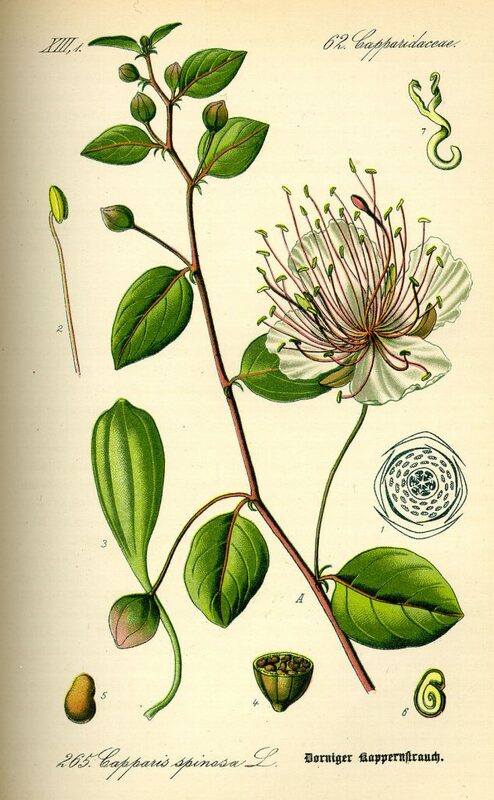 Chinese, Unani (Greco-Arab) and Ayurvedic medicine use himsra (Capparis spinosa) as a medicinal herb, and its use as a medicinal botanical is recorded in ancient texts from China, the Middle East and India. Image by Otto Wilhelm Thomé (1840-1925) (Flora von Deutschland Österreich und der Schweiz) [Public domain], via Wikimedia Commons. 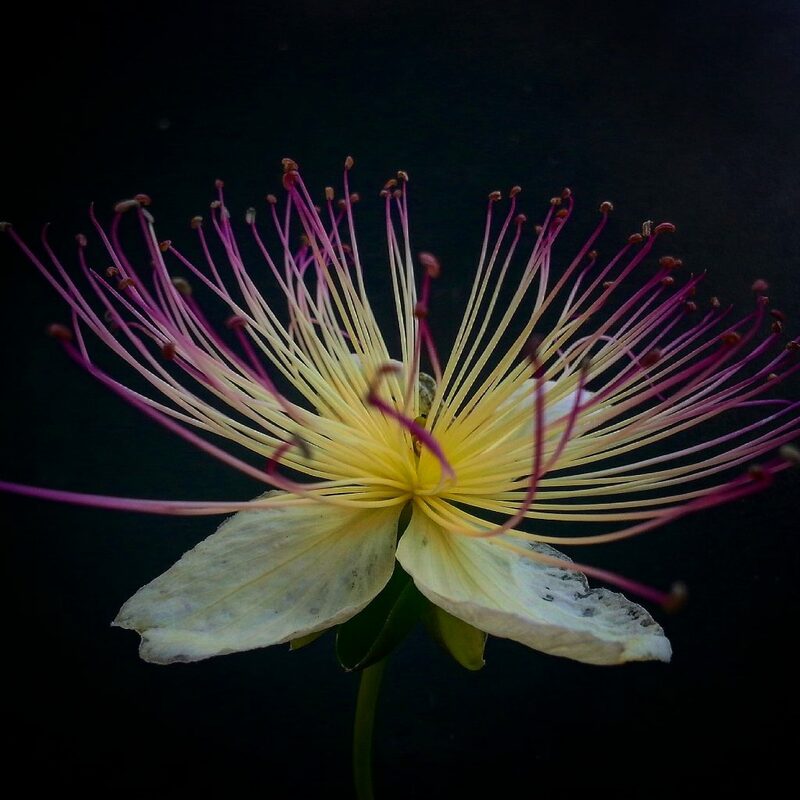 This entry was posted in Himsra (Capparis spinosa). Bookmark the permalink.